Tudor recorders are one of the best values on the market for classroom or home instruments. Quality construction, accurate intonation, and an easy 1 piece model, makes this recorder an excellent choice for your students. 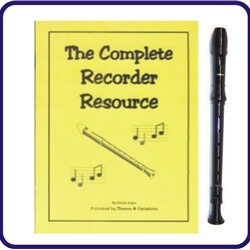 The Complete Recorder Resource book, by Denise Gagne contains everything you need for teaching a first year recorder program. The 42 student pages are written in both standard notation and kids note notation.